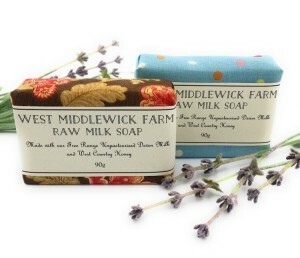 Scrub up in cow’s milk soap! 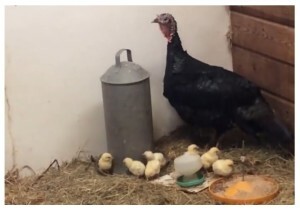 Amelia the turkey sat for on her eggs for 28 days and I got increasingly worried. Her eggs didn’t look viable and if I didn’t intervene, this was not going to end well! Thanks to Jonathan Hill of Hills Hatchery and Ross Gardner of Otter Poultry, I got a box of one day old chicks and I smuggled them under Amelia while simultaneously removing her bad eggs. RESULT! She loves them and they love her! At 2 days old they already knew where to find their food and water and how to cuddle up to their ‘mum’. She may be puzzled as to why her babies grow up to be chickens and not turkeys, but I have yet to meet a family which does not have some odd members who just don’t seem to quite fit in! Happy days! One of the main fundraising events for the Holy Cross, the Crediton Parish Church Festival, will run from 2nd – 7th June this year. The 2018 Festival has the intriguing title ‘In Our Element’ and work has been going on all year round to make this a memorable exhibition. The title of the last Festival was ‘What’s the Point’, and a big talking point was a rhino in the church. 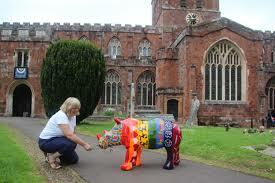 The rhino, kindly loaned by Exeter School, was subsequently decorated with flowers and the unusual sight of the rhino entering the church can be viewed via a video on our Festival Facebook page https://www.facebook.com/creditonparishchurchfestivals. There have been other wonderful displays over the last few years too. If you wish to see the fruits of a year’s planning and the skills of local flower arrangers working to this year’s brief then why not make a date for your diary to come to visit. Admission and Parking is free and there is disabled access. Opening times are 10.30am to 7pm on Saturday and Wednesday, 11am to 6pm Sunday, 10.30am to 6pm Monday and Tuesday, and 10.30am to 5pm on Thursday, the last day. Refreshments, snacks and meals are available in the nearby Boniface Centre, where the Newton St. Cyres Art Group will exhibit and sell their work. Free interesting and informative guided tours of the Governors Room and Church Tower will be available during the Festival. You will see floorboards dating from 1434, English Civil War artefacts, the retired town criers bell, the signature of Sir Redvers Buller and silver coins from a hoard found in 1896. In the Bell Tower you can see 12 bells (only 4 towers in Devon have 12 bells), clock mechanism and redundant chime barrel (musical box) and massive oak beams dating from 1532. Crediton Parish Church is a Grade 1 listed building, considered by many to be one of the finest in the country. 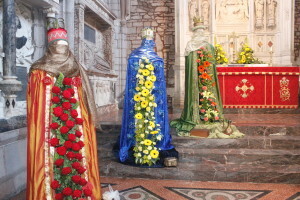 Proceeds from both the annual Christmas Tree Festival and Flower Festival provide much needed funds towards the upkeep and maintenance of the church. The church is heavily dependent on donations, legacies and grant funding to deal with safety issues, keeping water out of the building, structures and for bigger fabric projects. Current work includes north side drainage, painting churchyard railings and security improvements following recent break-ins. The South Devon hedgerows around Beeson Farm Holiday Cottages offer an abundance of edible flora, whether its Sloes in the Autumn for gin or Elderflowers in the early summer for making cordial. This spring the hedgerows are bursting with wild flowers and lots of wild garlic. Our favourite spots to forage for wild garlic are Stokenham Woods (up the lane opposite the church) or Loddiswell Woods (by Avon Mill Garden Centre), though wild garlic and its cousin, three cornered garlic, can be found in virtually every lane where there are bluebells. 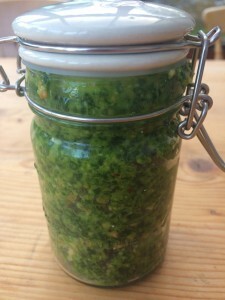 This pesto is wonderful served through warm pasta, with jacket potatoes, roast lamb or as an accompaniment to summer BBQs. This recipe makes 1 large jar which will keep for at least a week in the fridge. This lovely lady is a White Park cow. She lives at Gatcombe Farm and is currently waiting to calf out in the fields. 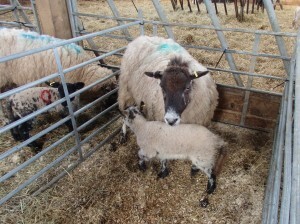 They are now designated a Rare Breed and are thought to have originated within the British Isles nearly 2000 years ago. 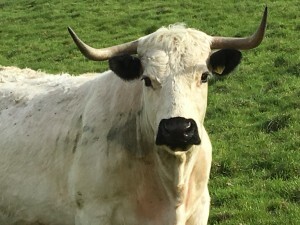 White Park cows are extremely efficient grazers and can be reared very economically as they’re known to prefer weeds and other coarse plants that most breeds would deliberately avoid. Most farmers keep them outside throughout the entire year and they’re hardy enough to thrive without supplements or even extensive shelter. They’re easily recognisable with their distinctive pearly white colouring with dark points around the nose, ears, eyes and tips of the horns. They have a docile nature and are generally bred as beef cattle. A trip on the Tivertonian offers a truly unique and memorable experience of yesteryear for you and your family to enjoy, being one of the last remaining horse-drawn barges in the UK. 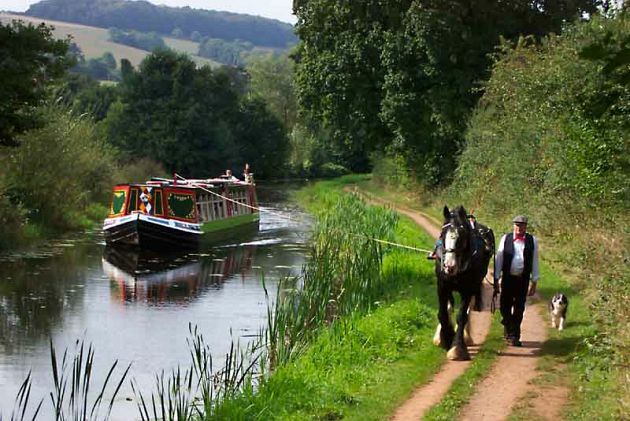 Located in magnificent Mid Devon on the banks of the beautiful Grand Western Canal, Tiverton Canal Co is a truly unique Living Heritage Tourist Attraction that offers an enjoyable family day out for everyone who loves boats, horses, wildlife and water. There is also free access to the Canal Park all year round. This beautiful wide beam, 75-seater horse-drawn Barge operates to Timetable from 1st April to 31st October with daytime Public Trips. 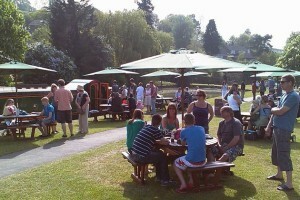 It is also available for Private Hire during the day and evenings. The best-loved trip is a 2½ hr return where the barge travels for one hour to East Manley, turns around and then moors up, allowing you the opportunity to take a short walk to see the aqueduct (designed by Brunel’s team of railway engineers), or talk to the horse as he rests for a while under the shade of a tree. During your special journey, you will hear memorable tales, anecdotes and historical facts about the horse-drawn barge and the Grand Western Canal. There is often two minutes silence, where the peace and tranquility of travelling by horse-drawn barge can be fully appreciated. The fantastic design of the horse-drawn barge means we are in action no matter what the weather! Large sliding picture windows can be raised or lowered dependent on the weather and time of year. The horse-drawn barge has easy access and is carpeted throughout with upholstered seating and modern flush toilet. Disabled access is available with prior arrangement – call Becky on 01884 253345 to arrange this in advance. Tiverton Canal Co offers a range of hire boats available hourly, which include Rowing Boats and Canadian Canoes, The Grand Western Canal supports a rich and vibrant variety of wildlife and interesting things to see. 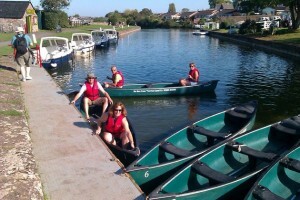 All the hire boats provide a great opportunity for you to get close to nature and explore the canal at your own pace. Boats available for hire include . . . Besides our own dogs and horses that spend much of their time on or near the towpath, the Grand Western Canal is a local nature reserve filled with wildlife and offers plenty to do and see. With free access to the canal all year round, walkers, cyclists, anglers and boat enthusiasts can enjoy 11 miles of quiet and unspoilt waterway that will lead you through Devon’s beautiful countryside. Don’t forget your camera! 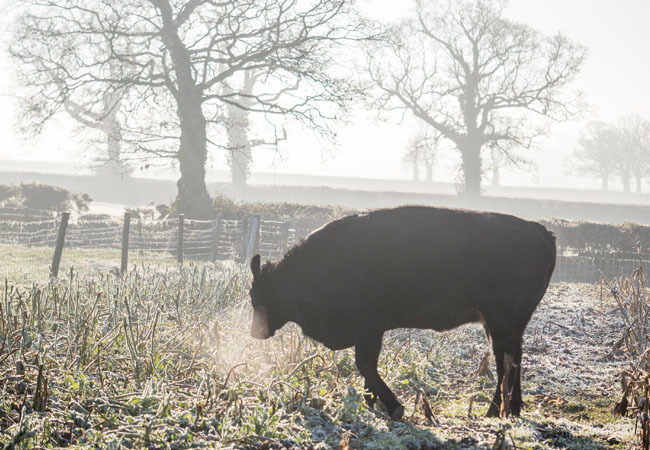 Yellingham Farm, like all farms, is governed by the seasons and, of course, the weather. The Spring brings new life, bouncing lambs, new growth of grass, hedgerows full of wild daffodils and buds bursting from the hundreds of trees on the farm. The Winter has its moments with crisp, white frosty mornings, but as December dawns and we move forward to the arrival of a New Year, the rains appear, the grass diminishes and disappears overnight. The River Tale floods and we watch as the sheep line up against the bare hedgerows for shelter from the wind and rain. 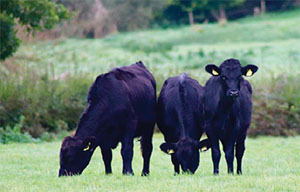 The cattle’s sleek, black, mink-like coats which they wear in the summer increasingly become long and thick to protect them from the cold. It is at this point that the inevitable happens. To save the ground from getting over grazed and poached and from having to use tractors over very wet ground to take hay to our cattle, we decide to bring them in. The day dawns and we bed down one of our large barns with wonderful yellow barley straw and set up big round feeder out in the yard for the hay, so that the cattle can wander in and out to their hearts content and are not confined to being totally inside. Happy cattle mean a happy me! Two large metal gates enclose the cattle yard and separate it from another large concrete yard outside the farmhouse, my beautiful vegetable garden, large fruit cage and the love of my life……. my polytunnel. The gates are really heavy duty, which they need to be as a mature bullock weighing some 400+ kilos takes some restraining and they regularly rub themselves up against them. I told the boys to check the gates and make sure that all the fittings were in good order. A bit of baler twine will not be sufficient to tie the right hand gate. This was a message delivered strongly on numerous occasions during the first week that the cattle were in. “Don’t panic Mum. It’s fine. It’s all secure. Stop moaning!”. “I always get up early. It goes back to my days as Executive Chef, when work started at 6am. It’s so peaceful without Janet barking orders at us poor males. It gives us time to prepare ourselves. On this particular morning, it was extremely dark, overcast with every chance of the day being a miserable one weather-wise. Little Lilly, a runt of a Jack Russell, Tilly the beautiful jet black spaniel and dear old Todd, the brown, fox-like collie all greeted me with such enthusiasm, tails wagging ten to the dozen. I put the kettle on the Aga for a much needed cuppa and walked to the back door where the dogs were queued up ready for their first run in the garden and a much needed wee. 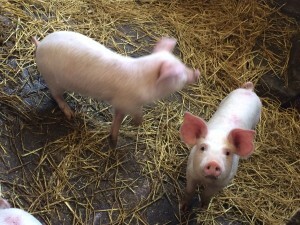 Overalls on, welly boots at the ready and a steaming hot cup of coffee in my hand, I put on my tattered, very smelly farm coat with the pockets overflowing with baler twine, fencing staples and other broken bits and pieces – I must empty them out – the coat would be much lighter. The first job is to let ‘Madam’s’ other collies out who live in kennels outside, then the chickens, before moving on to check the cattle in the barn. The kennels are to the right of the barns and as usual the 3 collies bound out ready for their day’s work and always make a bee line for the vegetable garden where the chicken house is situated. The poor chickens get gently rounded up for the first few minutes of the day by the collies, but this morning that fixed daily routine didn’t happen. Yes, the collies bounded out as usual, but as they rounded the yard and the 2 metal gates enclosing the cattle yard, they all skidded to a halt and in true collie style crept slowly towards the garden. It was still dark, but my eyes had focused to the darkness and my heart missed not one beat, but at least 100 beats, as there, looming in the distance were Madam’s six beautiful heifers. The baler twine tying the gate had let me down bigtime. The trouble was, as I stood there and told the collies to lie down and not move, I had no idea how “bigtime” this mistake was. The last thing I wanted was the collies to round them up, cause them to run and create even more damage, particularly because they never do what I say in any case. This had to be done quietly and with limited fuss. The collies were soon back in their kennels, totally bewildered by this sudden change to their early morning routine. One metal gate was wide open with the baler twine clearly in pieces. How many times had we been asked to mend the gate catch – doesn’t bear thinking about at the moment. I opened the other quietly so as not to wake her indoors. That was the easy bit. I fetched a stick, walked slowly towards the vegetable patch – fortunately the vegetables are grown in raised beds so hopefully no damage there. The fruit cage looked fine. The polytunnel had no visible holes in the plastic. I approached the cattle calmly as I didn’t want a stampede on my hands. They were nowhere near the lawn in front of the vegetable patch and were quietly grazing in the longer grass surrounding the chicken house. Phew! In the relative darkness, it looked like I had got off lightly. Maybe the odd hole in the long grass, but madam would hardly be able to detect it. Slowly the 6 beasts made their way back to the yard and I quickly fastened the gate with strong rope. Time to get off to work before she gets up”. 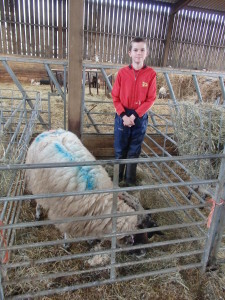 I continue…….. Edward is very good, he likes the early morning, so when I get up I can concentrate on my sheep and cattle. The day looked miserable but it was daylight and time to get on with the day’s work. First stop is my collies. Out they bound and off we go. But not today. They seemed a bit hesitant and when they approached the cattle yard they cowed down like they were ready to work. Daft dogs. The cattle were staring at me over the gates with steam billowing from their nostrils as the cold air made its presence felt. They looked happy and content. Next stop, the in-lamb ewes, which are in the field next to the garden. Normally the dogs are under the wooden gate and off at top speed, but this morning they were wandering around the chicken shed. Something wasn’t quite right with them. I sauntered over towards the vegetable beds and fruit cage and suddenly the reason for my dogs’ strange behaviour became apparent. I literally ran around the garden, over to the fruit cage, back around the chicken house before I stopped, sat on the edge of one of my raised beds and cried. I really cried. The damage to my garden was huge. 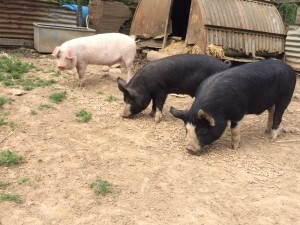 6” divots from 24 cattle feet, the black netting encasing the fruit cage was destroyed around the back, and to top it all they had climbed onto the raised vegetable beds and eaten my loved and tended Xmas Brussel sprouts. Do you know what I did? I cried again. Then the inevitable happened. Mobile phone out. Dialled Edward and, shall we say, the rest is history! I need not have dialled his number as my voice was so loud bellowing down the phone that he and all of his staff would have heard it 20 miles away. The gate catch took 5 minutes to mend, the damage probably took 15 minutes to achieve, and I wish I had taken a photo of the boys wheel-barrowing topsoil to fill in the divots, as that took weeks!